A couple of months ago, when I started running shorter distances while increasing my speed, I began burning more calories with each run. I figured, why not take advantage of this and cut back a little on my food intake and see if I can get a little lighter, which would help me with my running. Sort of a full-circle benefit: running faster = more calories burned + eating less = lighter body, which should mean I can run a little faster. I think this might be how algebra works, but don't quote me on that. Anyway, I cut back on treats (my beloved half of a cinnamon twist at Blue Baker went down to just a couple of bites) and I increased my vegetable consumption. 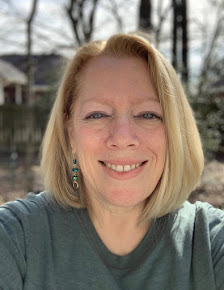 And while I could see a difference in my face (always the first place where any kind of weight loss shows up on me), I wasn't feeling much different in terms of lightness. 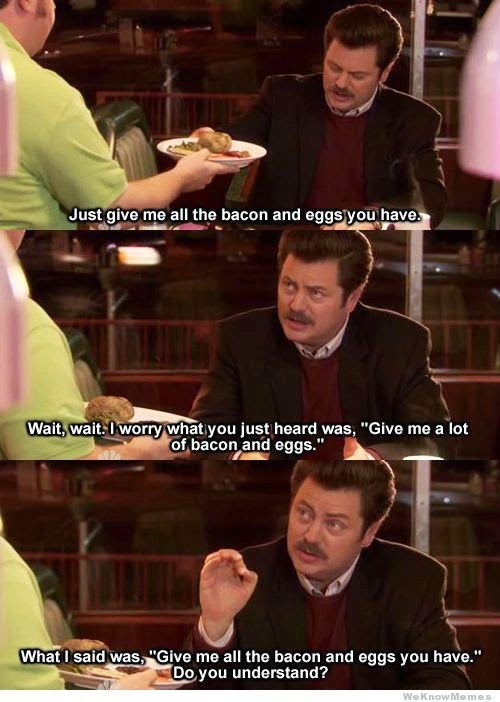 I do really good with portion control on a lot of things, but with some food, I go all Ron Swanson on it and that's where the trouble begins. So, I decided it was time to dust off the password to My Fitness Pal, log in, and track what I'm eating. It only took me two guesses on the password to get in - not bad after five years! I went back to my weight-loss calorie allotment, which isn't much for me...1,200 calories. Let me tell you, after a couple of days of tracking, I realized why I wasn't seeing much of a difference when I cut back, because 1,200 calories adds up fast! All this, for about 40 calories. Compared to a serving of sweet potato waffle fries, which is about eight of them. Sadness ensued when I measured out the correct amount. Happiness ensued when I ate them, because they were still dang delicious! Sauteed mushrooms and onions, tossed with roasted broccoli; English muffin pizzas topped with same veggies and a measured amount of cheese...I will say that you get a nice amount of cheese for the quarter-cup serving size, but I also realized that I was being a little too generous with my cheese, previously. The thing with cutting back on calories is that I'm definitely hungry for every meal, which is OK - nothing wrong with a little hunger. I usually go out to dinner at least one night a week with a friend, so while I don't want to skip lunch to save calories for a restaurant meal, I do try to cut way back on lunch. I was eating soup, but I was still pretty dang hungry before our dinner. Last week I was running errands and ended up drinking a 120 calorie protein shake at lunchtime, and then having a 170 calorie protein bar about an hour later (while still out and about) - I was not hungry at all, and I credit the 36 grams of protein that carried me through a busy afternoon and into the evening. My favorite - the Preston Trail chili cheese burger from Scotty P's. Oh heck yes! Am I seeing any changes now that I've been tracking my calories? Yes. My pants are looser, so in my mind, that translates to my legs running faster. I don't feel a whole lot lighter just yet, but time will tell. Any case, it's been a good exercise in reminding myself to pay more attention to portion sizes and also that I can live on less calories - most days, anyway. and I LOVE the sentence about PANTS LOOSER = LEGS RUNNING FASTER. That, for me, would make the tracking and food-focusing easy to maintain. Wow, 1200 calories reminds me of 2008. I may need to revisit that strategy myself. Hah! That's when I started this whole diet/blog thing! all your hard work when you don't watch calorie intake for two days. I'm switching my calories to more carbs on Fridays before my longer runs so hopefully I won't see anything impacting the running in a negative way. Do you have a weekly plan of lower calorie meals you make? As you may recall, this whole eating healthy and losing weight thing has been a struggle for my husband. He eats out lunch every day and dinner a few times a week ( for work), which doesn't help. I'd like to make things at home to keep him on track, or at least try. I'm a creature of habit and definitely get into food ruts - but it's easier for me to not have to think about it too much. I eat either my Greek yogurt/granola/fruit combo or a homemade egg mcmuffin for breakfast almost every day. Even if you got you husband to eat a healthy homemade breakfast, that might help his mindset to choose less for lunch (even doing a cup of soup/half sandwich combo might change things up for him). Yeah, tracking for a while does help with resetting my brain. I have been doing this a long time too and tracking gets tedious. Every time I think I can eyeball my portions & add my intake in my head, I realize I slowly increase calories. It's good to track now & then, even as only a refresher. Yep...and now I understand why (seemingly) perfectly-bodies actresses are shown flying off to a health spa for a week...even they need a reset once in a while. For a non-cook, that meal looks awfully tasty! I just might have to have some English muffin Pizzas for dinner tonight! Question--no pizza sauce on them? FYI: I had to google Ron Swanson. I'm "that kind of sounds like a Will Farrell character. But it doesn't look like Will Farrell." Funny. I used Boboli pizza sauce (I had some in the pantry already) - half of the pouch is 50 calories (1/4 cup) and didn't need much more than half of that amount, really. Hey, are you on facebook or Instagram? Not for my blog - just personal on FB. I'm the worst when it comes to social media and my blog, LOL. Since I've upped my protein to at least 30 grams of protein per meal, I am not remotely hungry in between meals - I can't believe I am down 5.6 pounds the last two weeks, I had a few glasses of wine, dinner out at Ruth's Chris, burgers with Jenn downtown and Easter - it just takes a little bit of consciously knowing what's going in my mouth to keep on track. Haha, I knew you'd comment on the onions! Back in the day when I was a WW leader and we weighed and measured things (instead of points), I distinctly remember doing an exercise at a meeting one evening to show members how easy it is for your eyes to readjust portion sizes. I held up a 4 oz. potato and a 9 oz. potato and asked them to pick the serving. Everyone picked the larger potato therefore reinforcing my point. Not that a 9 oz. potato is bad, it's just that you need to account for it! And that can be true both ways - it's just as easy to underestimate some things when you eyeball all the time. Whether I'm tracking or not, I often weigh and measure out things just to recalibrate my eyeballs. Here's to the hungries going away soon!! "recalibrate my eyeballs" is the perfect description of why I started tracking again - love that phrase! That photo of broccoli and E. muffin pizzas is making me salivate! Loose pants are a great sign, way to go. Lately I've improved on my dining out by having a restaurant picked ahead and researching the menus before I go. I've had some dang tasty lower calorie restaurant meals! I figure I do that for a while and I will have a good option or 2 down pat for the restaurants we hit most often. How time intensive is tracking on MFP, do you like it? I feel like I ought to do MFP or SparkP but haven't gotten past the thought of the up front work yet. MFP tracking is pretty simple now (when I started using it in 2008, I had to add in Fage Greek yogurt to the database!) because pretty much everything you might eat is in their database. And it remembers what you eat, so you will have a drop-down list of things to choose from if you repeat (like I do) often. I track all the time just because I always have and that is never something that bothered me. The only thing that does give the sads is how small some portions are for the calories - and that would always be a food I want more of! For me, snacks are what would be my biggest downfall and weighing ,measuring and tracking those makes such a difference. I struggle to get below 1400 calories, though. I just can't do it and this mid 40s body could probably lose faster if I did. Oh well. According to evidence from the National Weight Loss Registry which follows those who have maintained an average of a 60 pound weight loss for 5 years, food tracking is critical to maintenance. So is eating breakfast, not a chore for me, regular exercise (which you do) and regular weighing on the scale,which I know you're against and that's fine. (you use your face and clothes!) It is interesting to know that the studies say that's what is critical to weight loss. I am happy for you that your pants are looser and your legs are faster, that's why you are doing this. But keep an eye on the 1200 calorie thing, don't do it too long because in the long term it's way too little for anyone. But I guess you know that yourself too. I am not a great fan of tracking and it does become very tedious. I wish I could stick to the same meals all the time. I have an under active thyroid and going too low on calories throws my system off and then over exercising does too. I have yet to find the perfect combo that will help me lose, but I will keep on trying and will eventually find the perfect fit. Congrats on the looser pants. I'm so glad that this running season has been so great for you!